This is my story, I’m 46 and having a great time. I started running just over two years ago, but the background goes back a lot further. Back in 2004, I was over 25 stone, had a 56 inch waist and a BMI of almost 55. Whoops. Something had to be done, in fact a lot of something had to be done. Fortunately I managed to get my head together and over the next two years managed to lose eleven and a half stone. (Thanks Weightwatchers!) What does this have to do with running ? Well I kept the weight off until a couple of years ago, when I started to slowly creep up in size again, and having put a couple of stones back on, I decided to try to do something about it. So, in July 2014, I turned up at Braunstone parkrun, having never run in my life, and just about finished myself off managing to get round with a lot of walking. I felt embarrassed, and it took a lot of mentally fighting myself to actually stay there and do it when confronted with all those fit people. 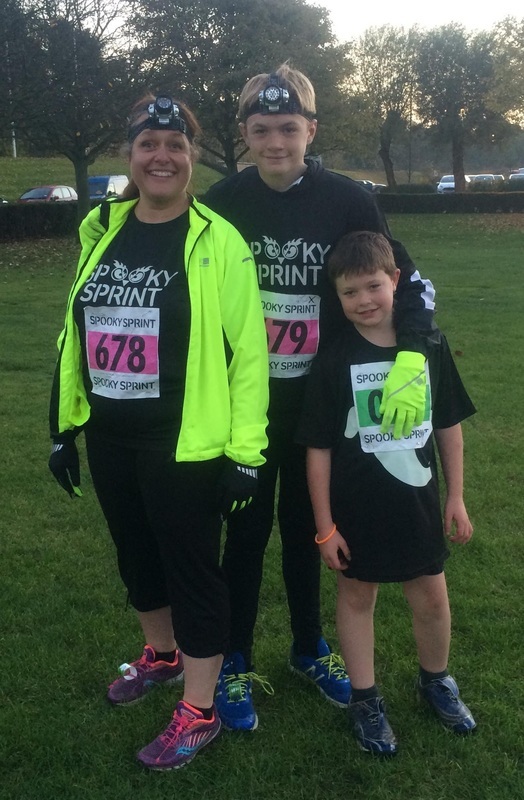 But I got round, and then decided to challenge myself to do the Couch to 5K programme. I downloaded the podcasts, and sneaked onto my old school playing fields so that no-one would see the idiot trying to run! Over the next nine weeks, I could feel myself improving, and running for longer, after the first three weeks, I outgrew the playing fields and had to move onto the roads, which again I felt very embarrassed to do, but got there in the end. I really enjoyed the challenge of Couch to 5K and by the end of it, I was able to complete parkrun without stopping, and my times were slowly improving. I spent the next year just doing parkrun every Saturday, but I wasn’t doing any other running, and the weight was still creeping on, and I began to think about joining a club to try and get out a little more often. 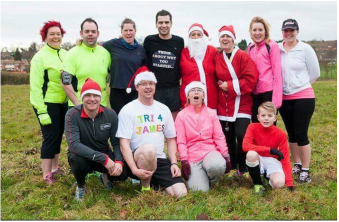 One parkrun late in 2015, Team Anstey turned up with the beginners graduation day, with a tent and everything! Seeing all the runners finishing their first parkrun was great, but the support was simply amazing to see, and the final clincher was that everyone went back to the tent for cake! This was the club for me…. 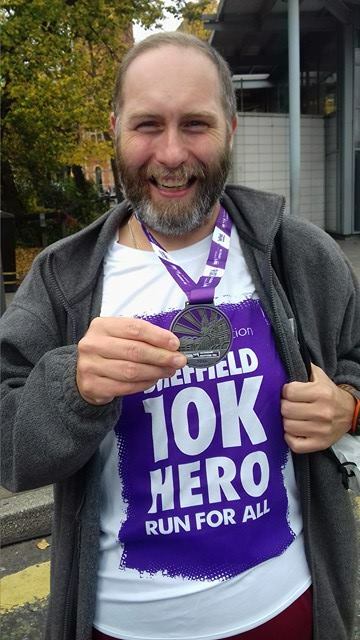 I had a chat with one of the members, Andy Lundy as it turned out, and a few weeks later, I nervously turned up at the library to join an evening run. The welcome was great, and I obviously had a good time, as I have kept coming back since! This is where my running really started to bloom, not in times, but in more events and distance, but more importantly enjoyment. Thinking “What had I done?” off we went, and after about half a mile I joined up with Alison Tupling as we were running the same pace, and we kept each other going, even up the hill at the end, and we crossed the line together to the most incredible reception from the rest of the Team Anstey runners and supporters who had stayed on to see everyone home (one of the best things about the club, long may it continue). I felt on top of the world despite being in the last half dozen or so finishers, and ran most of the league races last season. Since then, I have entered a whole host of events, mostly in the 10K category, some on my own and quite a few with other club members, and have really enjoyed them. 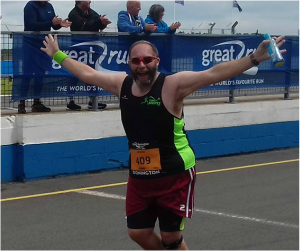 The biggest thing I have achieved though was to complete the Great North Run last September, which is an event I have watched every year on the television, and always dreamed of running, but never thought I would be able to until this year. So I turned up in the Northeast and stood on the start line next to an 8 foot yeti named Jon and realised what I was about to achieve. That was quite a moment. The event was amazing, I would recommend anyone to do it if they can, the final mile along the sea front is an incredible feeling, but the support around the while course you just wouldn’t believe. I got round the half marathon in just over 2 hours 42 minutes, but the time was irrelevant I was just so happy to have achieved something that I had always thought would be impossible. I’m not ashamed to say I was very emotional at the finish line, us men are allowed to cry you know! I can quite honestly say, that although I didn’t meet any club friends up there on the day, but it was Team Anstey that got me round with all the fantastic support and encouragement from everyone over the summer, and the sponsorship from so many of you, as well as a donation from the cake fund. Just to prove it wasn’t a fluke, I ran the Great Birmingham Half Marathon a few weeks later. I think I might be hooked! It all goes to show one thing, if *I* can get round these events, anyone can. I don’t have runners build, but I can at least call myself a runner! Never be afraid to challenge yourself. Enter the longer/different events, and don’t be afraid to walk parts of it. Getting round, and finishing is the main aim. Think of the cake and bling at the finish line! And above all, enjoy it! I’ve had some great runs with a gang of really good friends. Back in 2003 I was a slightly overweight new mum when my life was turned upside down after being diagnosed with breast cancer. I spent over 6 months having a variety of treatments that left me so weak I spent the following months building up my strength enough just to walk the 5k Race for Life. I began to enjoy my walking and several years later took part in the Moonwalk Marathon. However, walking was taking up lots of family time so I started to speed up (ever so slightly) to a jog. Then I heard about a new running and ambling club starting in Anstey. With great anticipation (surely they will be faster, slimmer, stronger than me) I turned up to my first night. Yes, I was at the back and taking regular walk breaks but Geoff and everyone was so welcoming and supportive. Since my first evening at TAAAR I’ve completed a few 5k runs, the Swithland 6 (more about that later) and two triathlons. My proudest moment was not only taking part in the Swithland 6 (yep I was at the back again) but winning the TAAAR Inspiration of the Race award. My top tips to anyone starting out; “just keep putting one foot in front of the other”. Some days this will be easy and speedy, some days just getting out of the front door is an effort but I guarantee you will feel better for it.